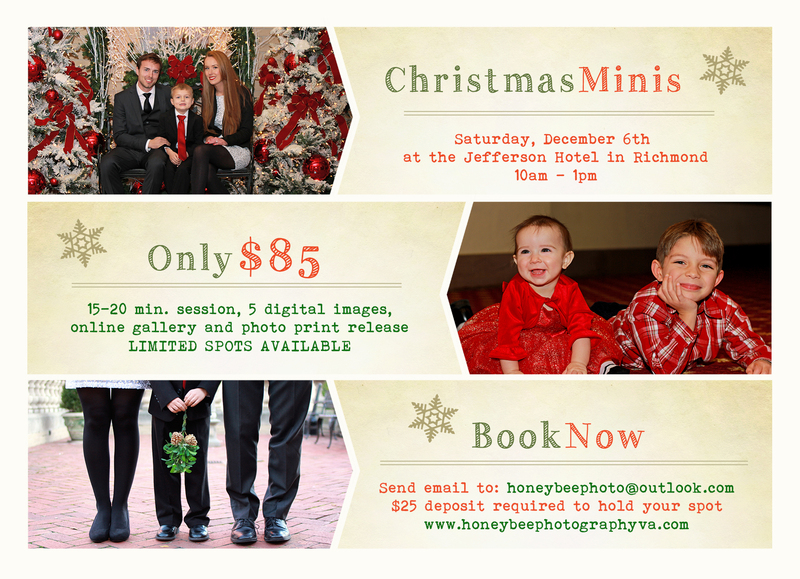 Honeybee Photography will be having Christmas Mini Sessions in Richmond, Virginia on Saturday, December 6th, 2014 at the beautiful Jefferson Hotel! I did these last year and everyone had so much fun! The huge indoor Christmas tree and decorations at the hotel are the perfect backdrop for holiday pictures. I only have 7 spots available. Session includes a family up to 4 people (additional charge for 5 or more) and 5 edited digital images. If I receive enough responses, I may schedule an additional day the following weekend. Please send an email to honeybeephoto@outlook.com if you would like to book! $25 deposit required and the balance is due on the day of your session. See flyer for details!